"Blunt force injuries to the right back and right side of the head were also present." "There were focal and poorly delineated right occipital subgaleal and right temporalis muscle hemorrhage." The Assistant Medical Examiner testified that these injuries were caused while Lee was still alive. According to the key witness for the prosecution, Adnan Syed strangled Lee while she was in the driver's seat of her 1998 Nissan Sentra, with Lee kicking at Syed and trying to say something like "I'm sorry" while she was being strangled. That same witness made no mention of Adnan otherwise striking Lee or using a weapon. 2. It is highly unlikely that Lee spoke or even came close to speech if she were being fatally strangled. 3. It’s possible that the blunt force injuries could have been caused by punches, but it is likelier that they were caused by a weapon or Lee's head striking some fixed object. 4. If Lee were in the driver’s seat of the Sentra while being strangled, it is highly unlikely that she could have kicked at her assailant. 5. It is highly unlikely that the blunt force injuries to Lee's head could have been caused by an attack on her while she was in the driver’s seat of her Sentra. In today's post, I will lay out the basics of the blunt force injuries uncovered in the autopsy. In successive posts, I will then explain conclusions 1-5. As noted, according to the autopsy report, "[b]lunt force injuries to the right back and right side of the head were also present." Blunt force injuries are "[i]njuries resulting from an impact with a dull, firm surface or object." Blunt force injuries can be contrasted with penetrating injuries, which are caused "when an object pierces the skin, organ or body cavity." [A]lmost all transportation fatalities — including those involving motor vehicle collisions, pedestrians being struck by vehicles, airplane crashes, and boating incidents — result from blunt force trauma. Other deaths resulting from blunt force trauma involve jumping or falling from heights, blast injuries, and being struck by a firm object, such as a fist, crowbar, bat, or ball. In an epidemiological study of 64 patients admitted to a hospital with blunt force injuries to the head, 55 (85.93%) were caused by motor vehicles accidents, 6 (9.83%) were caused by physical assaults, and 3 (4.68%) were caused by falls from height. Lee had a "focal and poorly delineated right occipital subgaleal...hemorrhage." A subgaleal hemorrhage is bleeding between the skull and scalp, leading to swelling. It is possible to bleed profusely from ruptured blood vessels below the scalp, potentially causing shock in the patient due to blood loss. This condition is most commonly seen after traumatic birth, although it can also be caused by a fall or blow to the head. In other words, Lee's subgaleal hemorrhage was right on the surface of the skull bone. Lee had a right occipital subgaleal hemorrhage. The occipital lobe is one of the four major lobes of the central cortex in the brain. It is located at the (posterior) back of the brain and is primarily responsible for vision. The occipital lobe is in pink. Some refer to the occipital lobe as the occipital lobes, with the "left" occipital lobe and the "right" occipital lobe being separated by the cerebral fissure, the main line that divides the brain into the right cerebrum and the left cerebrum. So, simply put, Lee suffered a blunt force injury -- an injury resulting from impact with a dull, firm surface or object -- that was significant enough to cause bleeding in the back right of the head below the scalp and the galea aponeurotica. One of the more common reasons for injury to the occipital lobe is being in an automobile crash. Any time there is significant impact to the back of the head, there is a risk for damage. Rear end car crashes are particularly bad for occipital lobe injury because the head quickly moves forward and backward. Often when jerking backward, the back of the head slams forcefully against the seat. The higher the speed is upon impact, the greater the potential for damage. Damage to the occipital lobe can also stem from any type of blunt force trauma. Although the human skull does a relatively good job of protecting the brain, excessive trauma to the back of the brain often results in occipital lobe injury. Things like falls, physical attacks and even sports injuries can create problems. Football players are especially at risk due to the prevalance of head-to-head contact. Lee also had a "focal and poorly delineated...right temporalis muscle hemorrhage." The temporal muscle, also known as the temporalis muscle, is one of the muscles of mastication (chewing). It is one of several chewing muscles necessary for crushing objects (food) between the molars. The temporalis muscle is located underneath the temple; if you bite down on a pencil and press your finger against your temple, you will feel the muscle bulge in and out. You have temporalis muscles on both the left and right sides of your head. The temporalis muscle is covered by the temporal fascia, a strong, dense layer of fascia (fibrous tissue). objective evidence for injury is that there was hemorrhage, albeit only a small amount, but there was hemorrhage in the membranes that cover her brain, and especially a portion of the brain known as the cerebellum which is a protected part of the brain. So that when you see hemorrhage in the linings that cover the brain and hemorrhage into temporal muscles, you've suffered a severe blow to the head, which means that you probably lost consciousness almost instantaneously. A focal traumatic injury results from direct mechanical forces (such as occur when the head strikes a windshield in a vehicle accident) and is usually associated with brain tissue damage visible to the naked eye. Furthermore, a poorly delineated hemorrhage can be contrasted with a sharply delineated hemorrhage or a well delineated hemorrhage. When a hemorrhage is poorly delineated, its borders are not well defined (as in the image above). 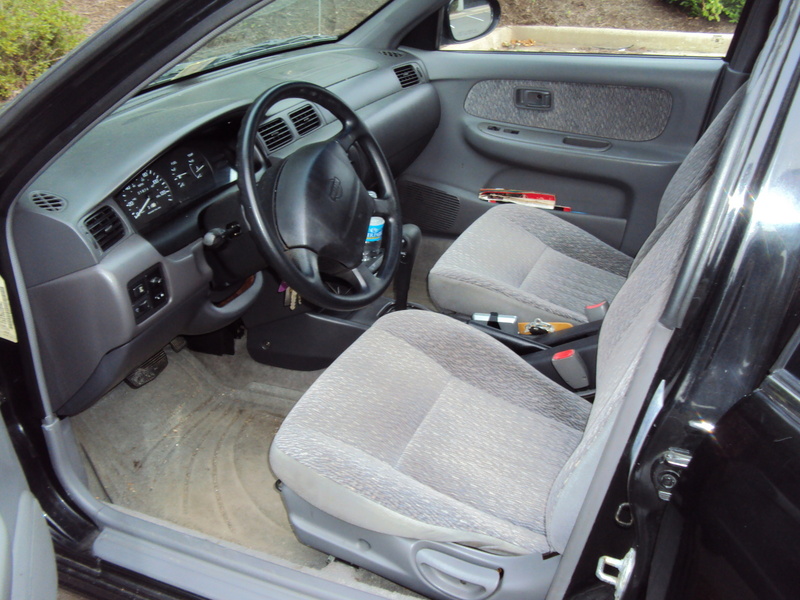 Here is a hyperlink to the interior of a 1998 Nissan Sentra. As you start to think about conclusions 1-5, picture the 5'6"-5'8" Hae Min Lee in the driver's seat and the 6'0" Adnan Syed in the passenger seat. From that visual image, try to picture Syed causing these blunt force injuries and strangling Lee while Lee kicks at him. This is what the experts mentioned in the introduction did. Conclusions 1-4 are important, but conclusion 5 is obviously the big one. If any readers have any expertise in pathology or a related field and would like to give me additional feedback before my final post, feel free to do so. I would love some additional opinions confirming or contradicting the fifth conclusion. OK, I'm imagining a verbal altercation culminating in Adnan Syed punching Ms. Lee in the head a couple of times -- perhaps indeed stunning her -- before strangling her. Like your experts, I'm having a difficult time imagining Ms. Lee effectively kicking *at* Adnan Syed during the strangling, but not such a difficult time imagining her struggling and kicking at the floor, console and dash as she tried to escape Mr. Syed's grip. From that position, I'm thinking that at best she may have been able to strike Mr. Syed with her knees, while he was leaning over the center console strangling her. Since the "kicking at" description is a second hand description from someone who wasn't there to witness the crime, I'm not sure that we can make too much out of the distinction between "kicking" and "kicking at", or whether Mr. Syed even made a distinction between "kicking", "kicking at" or "hitting me with her knees while she was kicking at the floor" during Mr. Syed's retelling of the murder to Jay. Point 5: But, if the assailant is sitting in the back seat and strikes the victim with a heavy object—maybe even bare fists if enough force used (but then we'd expect to see injuries to the assailant's hand)—Victim hears a noise, turns her head to the right and is struck on the right temple. Reflexively turns away from the blow with head angled down and then is struck in the back of the head. However, it's possible for this same scenario with the attacker sitting in the passenger seat; one who is at least 4" taller than his victim. Blow to the right temple region, victim again turns away from blow and hit in the back of the head. Stories by a highly unreliable witness of the victim kicking or trying to speak seem to be moot points—not verifiable in any way and not even pertinent to the case. The broken indicator could have happened when the victim was being removed from the car or under completely unrelated circumstances. The injuries are definitely possible while in the drivers seat with an assailant in the passenger seat. Attacker grabs driver and she tries to escape, turning her face toward the door to exit. Attacker smashes right side of head (facing away) into steering wheel exposing the back of the head to either be punched, struck by an object, or pulled backward into the dashboard causing a strike to the back-right side of the head. This would also have the victim facing away making strangulation easier and preventing the victim from striking back. Like the last comment says, she could have been trying to get out of the car when she was struck. I want to address the first comment to this blog post, written by DavidsonD. I believe that comment exists only for the purpose of trolling, and to deliberately besmirch Adnan by needlessly and gratuitously repeating his name. Your work has shown that alternate scenarios are much more plausible in this case, and this comment only serves to mock that work. The very purpose of your column is to examine evidence objectively and consider reasonable explanations. Please do not allow it be used as a forum for self serving attacks. I hope you are able to address this, and if possible, remove the comment. Thank you for your exaustive research. Each posting is excellent. If the blunt force trauma caused unconsiousness, could the perp think that she was dead, panicked and shifted her to the trunk and then she died in the trunk? What if, in attempting to get free of the strangulation attempt, her head gets wedged under the steering wheel and the contusions are from the steering wheel? My other thought is that it did not occur in the car. Perhaps it started in the car and ended in a parking lot where the head injuries could have been a result of the smashing of her head against the asphalt to concrete type of surface. I need to reread the autopsy report, but this is so similar to what I am currently investigating in the Jon Benet Ramsey case. Is it not plausible that the injuries to the back of Lee's head were caused by her head striking or being pushed into the closed door and/or frame while she was being strangled? That certainly seems simplest: she's facing her attacker in the passenger seat; the steering column is to her left, her right is to the headrest. Her attacker is practically on top of her; her head strikes the metal where the window rolls down, or the frame below where the upper end of the seatbelt attaches, or possibly even strikes the glass with enough force to cause subdural bruising without breaking it. It's injuries inflicted in the same assault. The other consideration, and one which makes me think it could have been caused by the steering wheel or something similar is the skull was not fractured. If it had been some kind of significant blow to the head, you'd expect to see a fracture. Every single theory about what happened to Hae on 13th January 1999 means having to make huge assumptions, ignore some of the evidence and/or taking leaps of faith, that includes the State's own timeline. If that is not the very definition of reasonable doubt then I don't know what is. I don't think the head injuries are inconsistent with a possible altercation in Hae's car. Could it not be possible for the right temporalis hemorrhage to be caused by the killer, in the passenger seat, slamming her heard into the steering wheel of the car? She looks out of the driver side window, the killer reaches up, with either hand, and grabs her head and slams it into the wheel, leaving her dazed. Next, the killer grabs her throat, and pushes her back head back into the headrest, with sufficient force to cause the right occipital subgaleal hemorrhage? If there is a reason why these injuries could not have occurred from this sequence of events, I would be interested to hear why. It seems that the back of the head could have been slammed down onto the top shoulder of the driver's side door frame, where the window recedes into the interior of the door. It seems that conclusion 5 is too strongly worded. It seems only possible that she was attacked elsewhere, and not "highly unlikely" that she wasn't attacked in her car. Why the emphasis that these injuries are consistent with Hae being unconscious, any more than they are consistent with her remaining conscious (albeit shocked/in pain). I'm not convinced the evidence in the post backs up this assertion - the example from the court case refers to someone that had suffered an injury to the membranes of the brain, as well as temporalis muscle damage, so this can't really be used as evidence of seriousness of all forms of temporalis muscle damage. Further, the brain injury pictures are a bit misleading, as they imply Hae’s injuries were more serious than they were – the autopsy report states that there was no evidence of brain injury. Are there no descriptions/pictures of focal versus diffuse temporalis muscle/similar muscle damage? Is the diffuse versus focal nature of the damage to the muscle indicative of different causes of injury? Again, the brain injury description is misleading, as diffuse brain injury is caused by, e.g, the brain moving backwards and forwards against the skull (such as due to rapid deceleration in a car crash), and the same can't be said for a muscle. Thanks for all of the feedback. This is just a preliminary post laying out the basics, and I will get to the specifics in my subsequent posts. As a side note, there was no evidence of Lee suffering an injury to her actual brain. My images of the brain and the focal injury to the brain are just to demonstrate the location of the occipital lobe and the appearance of a focal injury. These were the best images I could find on Google Images after filtering those images that allow for reuse. The contusion could very well be from the trunk shutting/hitting Lee in the back of the head as she was forced into the trunk alive.